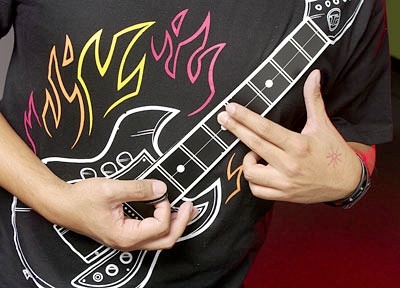 ThinkGeek has a Electronic Rock Guitar t-shirt with a touch-sensitive guitar fret that you can actually play. A mini amp clips to your belt that you can turn up to 11. The Electronic Guitar Shirt is not a toy that plays pre-canned musical riffs, it is a real musical instrument that allows you to play your favorite songs and sound great doing it. All major chords are recorded from a real electric guitar, and the included magnetic pick allows you to strum just like you would a real guitar. The included mini amp clips to your belt and gets plenty loud with great sounding amplification circuitry. 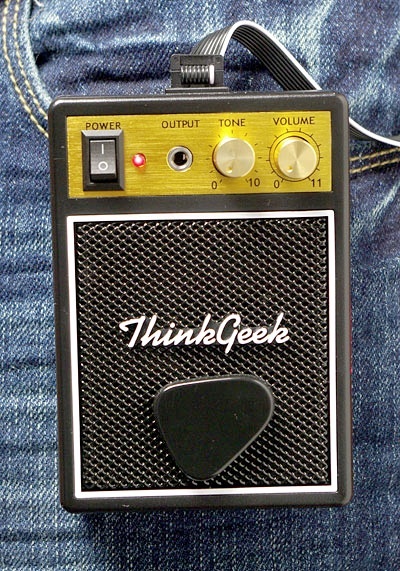 The tone knob on the amp lets you adjust the sound just like a real guitar.